A pro player since he was 16 years old, Domingo Leyba is one step away from the Major Leagues. Domingo Leyba is a rising star in the Arizona Diamondbacks’ farm system. 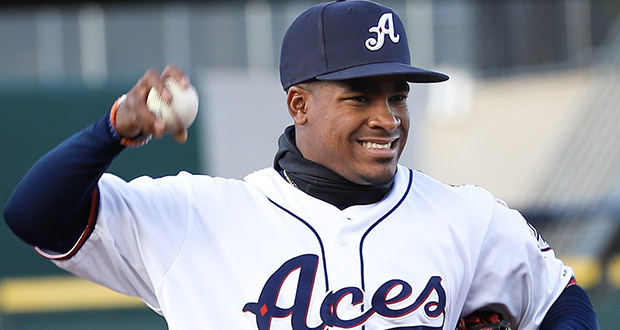 Leyba, 23, was one of the lone bright spots for the Aces in its 13-2 loss to the Albuquerque Isotopes on Wednesday night at Greater Nevada Field, going 1-for-3 with a double and a walk. Leyba remained in the lineup after getting hit in the calf Tuesday night. Traded to the Diamondbacks organization in 2014, Leyba is one step away from making his major league debut. He was added to the Dbacks’ 40-man roster this offseason. The rangy Leyba showcased his defensive prowess, bare-handing a toss from second baseman Kelby Tomlinson and fired a laser to get the runner out at first for a double play in the second inning. While Leyba can use either hand to get the job done defensively, he translates his ambidextrous play offensively, as well. A switch-hitter, Leyba’s quick hands helps turn on pitches and drive baseballs the gaps. An anomaly for left-handed batters in downtown Reno, Leyba doesn’t swing for the fences. Leyba’s balanced play has gained the attention of Tomlinson. A native of the Dominican Republic, Leyba’s journey through professional baseball began as a 16-year-old. He competed in the Reviving Baseball in Inner Cities World Series, a youth initiative program dedicated to provide baseball competitions and activities for kids in underserved and diverse throughout the United States, Dominican Republic and Cuba. A few major league teams took notice. The Tigers signed Leyba to a minor league contract in 2012 and sent him to the Dominican Summer League Tigers in 2013. He his way through High-A before he was dealt to the Dbacks in 2014.-Leyba was one of the prospects involved in the three-way deal between Arizona, Detroit and the New York Yankees that sent southpaw Robbie Ray to the Dbacks and shortstop Didi Gregorius to the Big Apple. After an injury-riddled 2017, Leyba rebounded in 2018 with 86 hits and 30 RBIs at a .269 clip in 83 games with Double-A Jackson. Leyba has progressed through the Dbacks’ farm system and it has put him one step away from the show. Rated as Dbacks’ No. 26 prospect according to MLB Pipeline, Leyba is blending in with the rest of the guys on and off the field. He and Cuban slugger Yasmany Tomas have formed a friendship in their time together. Taylor Widener had a rough outing in his Reno debut. 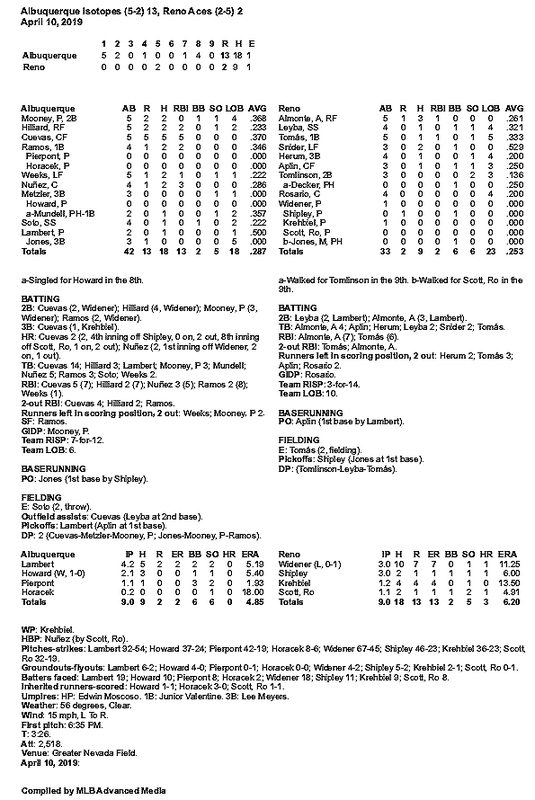 Albuquerque tied the three-game series 1-1. The rubber match will take place Thursday at 6.35 p.m. The Isotopes’ bats exploded for 18 hits in the win on Wednesday. Center fielder Noel Cuevas hit for the eighth cycle in Isotopes history, driving in five RBIs. Cuevas singled in the first, doubled in the second, homered in the fourth and clinched the cycle with a triple in the seventh. He poured it on with his second homer in the top of the eighth. Reno’s nine hits mustered just two runs on the night. Abraham Almonte finished 3-for-5 with a double and RBI. Yasmany Tomas went 1-for-5 with an RBI single. He’s recorded an RBI in every game this season. Just called up from Double-A, third baseman Marty Herum started in place for Wyatt Mathisen and recorded his first Triple-A hit of his career. Herum finished 1-for-3. 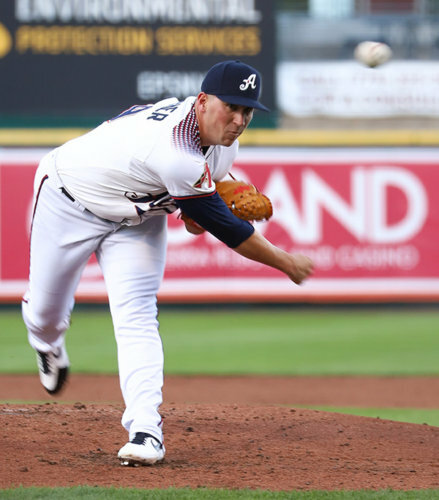 Aces’ starting pitcher Taylor Widener struggled on the mound. The right-hander gave up seven earned runs on 10 hits in three innings of work. University of Nevada, Reno alum Braden Shipley surrendered one earned run in three innings pitched. A three-run blast from Nunez capped-off a five-run, five-hit first inning for Albuquerque. The Isotopes tacked on another two runs in the second to bring the score to 7-0. The Isotopes pushed their lead up to 8-0 in the fourth inning off Cuevas’ bomb that carried to right field. The Aces chipped into the deficit with a two-run fifth inning. Albuquerque poured it on in the later frames of the contest. They plated one run in the seventh and four more in the top of the eight to make the final score 13-2. Dbacks call up Caleb Joseph: The Arizona Diamondbacks recalled catcher Caleb Joseph on Wednesday. Catcher Matt Jones was transferred from extended spring training to Triple-A Reno. Jones, 26, hit .250 with 18 RBIs in Double-A Jackson last season. He had one at bat with the Aces in 2016, a double. Notes: Cody Decker is three games shy of 1,000 career MiLB games. He has appeared in two games with the Aces this season. … Chris Cron was born in Albuquerque on March 31, 1964. … Taylor Clarke’s nine strikeouts on Tuesday marked the most strikeouts from an Aces starter in a home opener. Both teams combined for 27 hits. … There was a paid attendance of 2,518.